We at Geeky Hobbies would like to thank Valhalla Cats for the review copy of The Purring Quest used for this review. Other than receiving a free copy of the game to review, we at Geeky Hobbies received no other compensation for this review. Receiving the review copy for free had no impact on the content of this review or the final score. In The Purring Quest you play as Kimchi the cat. After the death of his wife, Kimchi’s owner gets depressed. After visiting his wife’s grave one day he accidentally leaves Kimchi alone at the cemetery. Kimchi needs to find his/her way home and cheer up his/her owner. The Purring Quest for the most part plays like a typical platformer. Most of the gameplay involves jumping between platforms/obstacles. Kimchi has two jumps one which has Kimchi jump more horizontally while the other makes Kimchi jump more vertically. Kimchi also has a scratch attack that is used against smaller animals that attack. Finally the game has some light stealth elements where Kimchi needs to avoid alerting dogs or humans. While I wouldn’t consider myself to be a big cat person, when I saw The Purring Quest on Steam I was interested in seeing what the game had to offer. There are so many platformers on Steam that it is hard to differentiate yourself in the genre. What made me interested in The Purring Quest was the art style and the fact that the game was a platformer where you played as a cat. I was intrigued to see what the game would do to differentiate itself from other platformers due to playing as a cat. While not fantastic, The Purring Quest is a solid but short platformer that will mostly appeal to cat lovers. While I had some fun with the game, I kind of wish it capitalized more on the “cat platformer” idea. The game doesn’t really play much different than your typical platformer. The running and jumping mechanics feel slightly different due to how the character moves but how you actually play the game isn’t any different from what you would have experienced in other platformers. You jump between platforms, collect collectibles, and try to avoid/defeat enemies you encounter. While the mechanics work well for the most part, there isn’t anything particularly new in The Purring Quest. The controls are kind of hit and miss. I played the game with a Microsoft controller so your experience may differ with a different controller or with the keyboard. All of the mechanics outside of the jump were pretty responsive. 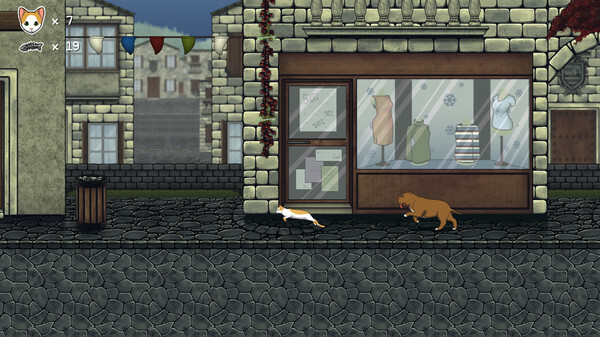 The run does take a while to adjust to since it takes a while for the cat to start running at full speed. I am guessing this was done to simulate how a cat would run. The jump controls on the other hand were kind of frustrating. I don’t know if it was my controller or something else but I never could adjust to the jumping controls. At times they seemed unresponsive. Basically the character would only jump when standing still or in a full run. The jump button didn’t seem to work in between the two. At times I would press the button and nothing would happen which lead to pretty much all of my deaths in the game. This is usually typical of games with frame rate issues but this was not the case since I was regularly getting 40+ fps. The jumping controls as a whole could have used some work. For most of the game this is not a big problem since the platforming isn’t timed so you can take your time to line up the jumps. This all changes in the last section of the game though. In this section the platforming is “timed” where you have to keep running and jumping or you die. This gives you very little time to actually time your jumps. This lead to many deaths as the jump button did not respond as I thought it would. I probably had to repeat the last section of the game for at least 30 minutes because I just couldn’t get the jump button to work properly. If it wasn’t for the troubles with the jump button this section probably would have taken one or two minutes to complete. Despite the problems with the jumping, I wouldn’t consider The Purring Quest to be that difficult. If it wasn’t for my issues with the jumping, I would have breezed through the game. I play a lot of puzzle platformers so that might explain why I found the game to be easy but if you are looking for a really challenging platformer, The Purring Quest is not going to be it. The game is really straight forward and none of the platforming is that challenging. The presentation might be The Purring Quest’s greatest strength. The graphic style is one of the first things that attracted me to The Purring Quest and I wasn’t disappointed with this aspect of the game. The animations for the most part are pretty smooth. The backgrounds are also really well done even though sometimes they make it a little hard to see where you are supposed to jump. The music also helps create a good atmosphere for the game. The rhythm mini game that makes an appearance in the game is annoying. I haven’t played a rhythm game in quite a while but this mini game shows that playing a rhythm game with a regular controller doesn’t work that well. While not the most complicated song for a rhythm game, it was more difficult than it needed to be. Due to not being much of a cat person, I really didn’t find a lot of humor in the game. The game has quite a few puns or references to cats in general which I didn’t find particularly funny. Cat people might get a lot more enjoyment out of them though. Overall the story is decent but it doesn’t play a big role in the game. Outside of the opening and ending cutscene the game doesn’t really address the story much. One of the biggest problems with The Purring Quest is that the game is not particularly long. The game has five levels which take only around two hours to complete. While I didn’t collect all of the collectibles , whenever I saw one I tried to collect it. If you want to collect everything the game may take three to four hours to complete. While some people may enjoy replaying the game, I don’t see The Purring Quest as the type of game that provides a lot of replay value. When you factor in the length, the price tag of $11.99 seems to be high. For this first week the game is 30% on sale which is a more affordable $8.39 which is still high in my opinion. The game just doesn’t have enough content in it to be worth $12. In my opinion it is more of a $5-$7 game especially with how many platformers there are on the market. Unless you are a big cat person I think you should wait for a bigger sale on the game. One thing I do have to mention about The Purring Quest is that some of the proceeds from the game will go towards animal welfare charities. Should You Purchase The Purring Quest? Overall The Purring Quest is a very average platformer. The art style and atmosphere are easily the best parts of the game. The game is fun but doesn’t really do anything new with the platforming genre. The jumping controls could use some work but you can work through them. Without the issues with the jumping controls, the game is pretty easy which leads to the game being only around two hours long. As far as recommendations go, if you don’t like platformers The Purring Quest won’t change your mind. If you like platformers the game is probably worth picking up at some point. If you really like cats the game might be worth picking up at retail price. If you don’t love cats though I would recommend waiting for a sale on the game. An interesting idea for a platformer. The artwork and music are well done. The jumping controls are imprecise and lead to some frustrating moments. The game is short at around two hours.